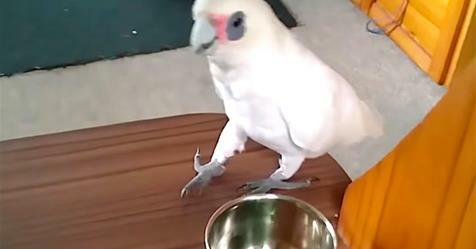 Home › entertainment › videos › She Gives Her Cockatoo A Bowl Of Broccoli. Now Watch What He Does With It... Hilarious! She Gives Her Cockatoo A Bowl Of Broccoli. Now Watch What He Does With It... Hilarious! Broccoli must be the world’s least favorite vegetable to eat. This video proves that humans aren’t the only species to dislike this nutrient-filled vegetable. As it turns out, cockatoos aren’t the biggest fan of them either… Or rather, this particular cockatoo isn’t. Erick the cockatoo truly hates broccoli. So much so that he gets pretty inventive with his response to the mere sight of it. Little does he know how good vegetables are for him and all pets alike. I never knew how good fresh vegetables are for pets, but If I were a pet owner, I’d probably do the same thing that this woman is trying to do in this video. It really is amazing how many different types of fruits and veggies are good for your pets. From ripping his broccoli to shreds, throwing each piece of broccoli on the floor, and then finally, my personal favorite, throwing the entire bowl of broccoli to the ground, you can say that this bird really can’t stand this green veggie. His doctor instructed that he eat more broccoli, but Erick just can’t seem to do it. If I were his owner, I’d find a way to disguise this vegetable, or mash it up as a way of seeing if the bird can eat that. Regardless, this video is truly entertaining to watch and only gets better as it progresses.